First step to the new world . Onepark isn’t just a park, it’s the only park- a place to chill for all the skaters in Japan’s Tohoku area. In Japanese, it means no matter how old we get, we’ll never forget that we’re about pure skate mischief and fun. In the wake of the Great East Japan Earthquake of 2011, after all sense of enjoyment seemed gone, the idea of Onepark was born from an idea among friends for a place to regain what we lost and gain something new—a place to skate. 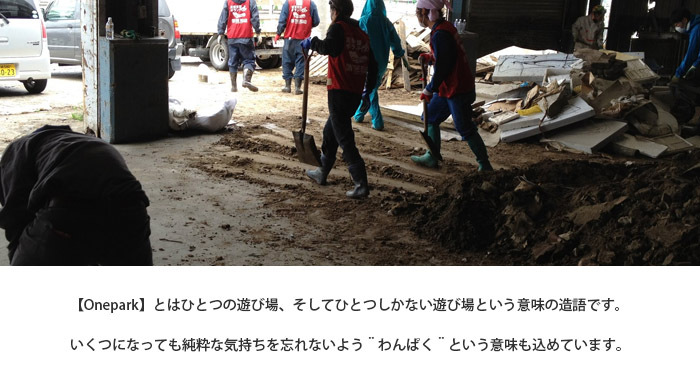 Thanks to the good people at the fishing companies at the harbors of Ishinomaki city who suffered along with rest of the people here, they’re letting us borrow one of their destroyed warehouses for three years. So for us, in the rubble and chemical remains of a warehouse with no water, gas, or electricity, we started to work on our park. The first step in recovery, and the first step to the new world. It’s our dream to showcase to the people here, in the center of where a disaster hit, the world’s top pro skaters, artists, and bands. To start and continue to skate, and to see and feel with their own eyes and ears sick music and art. Not only that, but for Onepark to be seen by the rest of Japan as what can be accomplished through the power of skateboarding. And then when we can live and laugh ourselves into old age, it would be good to be known, by either one person or many, that we’re the fam at Onepark and we did it big. We’re going to do everything we possibly can (cleaning, maintenance, building sections, etc.) to make this place great. Living in a place where so many people have been affected by the earthquake of 2011, we can’t put ourselves above the rest or be selfish, but to be honest, we could also use your help! We’ve got few connections and a three year time limit to make this place as great as we can, but we can only do so much. So for all those in the skate, music, or art community, or anyone just digging what we’re doing, we’d be grateful to have all the help we can get. Whether it’s donations, connections, materials, promotion, whatever, we’re thrilled to get whatever help that’s willing. We’ve been blessed with good luck and good friends, so of course, the crew here at Onepark will enjoy every minute of it to the very end. There are those of us who’ve lost good friends and family in a disaster that can’t be forgotten. And that’s exactly why we value the connection we have and we want to share what precious time we’re given with all the good people in the skate community. Onepark will start our preopening from September 9. When we say preopening, we mean that there’s not really anything we can yet call sections, and there’s still some cleaning up to be done, but we’ve got some boxes, rails and ramps for the time being. So come chill and skate. We’re not trying to bother you with all sorts of details and rules, so just have common sense, be good to each other, skate, and have fun. Let’s use the three years we’ve got and make it as sick as possible.